The provincial government is taking action to combat rural crime by investing $10 million in more RCMP officers, civilian staff and Crown prosecutors. Minister of Justice and Solicitor General Kathleen Ganley and RCMP Deputy Commissioner Todd Shean announce new initiatives to fight rural crime in Alberta. The seven-point action plan includes an $8-million investment in 39 new officers, 40 civilian staff and $2 million to hire additional Crown prosecutors. This strategy will help reduce rural crime by putting resources where they’re most needed. Measures are also being introduced to ensure police have the resources needed to address their top priorities. These steps include focusing on intelligence and sharing information to help police better identify and catch prolific offenders, and shifting some routine tasks to civilian workers so officers can spend more time patrolling and investigating in the community. Crime reduction units: Specially trained officers will focus on arresting prolific offenders. This initiative will expand on a successful pilot project in Central Alberta. Specialized police intelligence: Six additional intelligence-focused RCMP officers plus four crime analyst positions will allow the RCMP to identify prolific offenders and target organized crime. Policing support centre: RCMP officers need to be on the streets protecting our communities, not behind a desk filling out paperwork. Twenty-three civilians will input investigative updates dictated over the phone by officers. More Crown prosecutors: $2 million will allow the Alberta Crown Prosecution Service to hire up to 10 Crown prosecutors who will focus solely on rural crime. 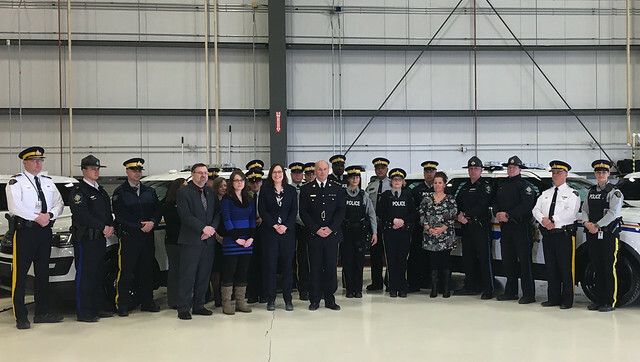 Better coordination: Sharing information with Alberta sheriffs, Fish and Wildlife Enforcement, Commercial Vehicle Enforcement and conservation officers will effectively make these officials additional “eyes and ears” for police. Enhanced technology: The RCMP will work with Alberta Justice and Solicitor General and other partners to explore new ways of using technology to target rural crime, including bait programs. Public education and engagement: The RCMP will engage and educate Albertans about crime prevention. The $8 million in new funding is from the provincial government. On top of this, the federal government will contribute its share under the Provincial Police Service Agreement (PPSA). Under the PPSA, the Alberta government contributes 70 per cent and the Government of Canada contributes a further 30 per cent. With both provincial and federal funding, the total amount is about $10 million. An additional $2 million will go to the Alberta Crown Prosecution Service. In 2017-18, the Government of Alberta invested more than half a billion dollars into policing, which includes 1,560 officer positions in rural Alberta. The PPSA provides policing at no direct costs to all rural municipalities. This includes municipal districts, counties and Métis settlements regardless of population, as well as towns, villages and summer villages with a population of 5,000 or less. The Government of Alberta also contributes $29.1 million to Alberta Law Enforcement Response Teams (ALERT), an integrated, provincewide response to serious and organized criminal activity that crosses local and regional boundaries.